A thriller centered on the threat posed by a deadly disease and an international team of doctors contracted by the CDC to deal with the outbreak. 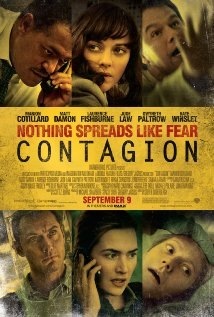 Contagion is a very unique movie for a number of reasons. Firstly, it is shot with elements of both a documentary and a typical Hollywood drama. Unfortunately the style does not lend to a particularly compelling presentation. I was left feeling that the movie was neither personal enough nor informative enough. There appeared to be a lack of focus regarding what exactly the movie was supposed to be. This is not to say the movie was not interesting, because it was. The movie was successful in taking the audience through what it would be like to be involved in the middle of a massive disease outbreak. It was certainly interesting to see what society would have gone through with outbreaks in the past, before we had become effective at curbing these disasters. Matt Damon’s character was hard to read and his performance was not up to his usual standard. The movie also failed to develop a connection between other main characters and the audience which took away from the personal elements as the movie progressed. Overall the movie missed the mark, but the concept was unique and intriguing and still worth a watch, if only as a rental.